When Molière’s satiric play “The Misanthrope” first came to the stage in 1666, at the Théâtre du Palais-Royal in Paris, its mockery of society as duplicitous, self-aggrandizing and narcissistic must have had audiences teary-eyed with laughter. 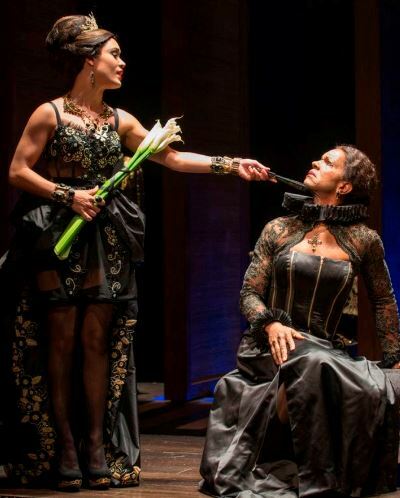 Just so is Court Theatre’s deliciously decadent new production LOL stuff. Indeed, director Charles Newell’s imaginative, sharply executed enterprise is simply not to be missed. The misanthrope in question is a high-principled fellow called Alceste, whose disgust with society’s hypocrisy has led him to the brink of abjuring all contact with men and women alike. Ah, except for the beautiful Célimène, an irredeemable coquette who nonetheless holds Alceste’s heart in her delicate hand. And so we observe Cupid’s cynical fool as he reviles the devoutly disingenuous souls around him – even as he suffers in pursuit of that flitting butterfly Célimène. For audiences watching “The Misanthrope” three and a half centuries after its premiere, in a different world and of course in another language, the idea of every line of the play, whether monologue or dialogue, being delivered in rhymed couplets might seem hopelessly antiquarian. Au contraire. When the modern setting is rendered with the crispness and panache of Richard Wilbur’s translation, and delivered with the conversational ease – and throwaway wit – displayed by Court’s cast of characters, what might be forced technique becomes a tour de force. The show is steered immediately onto the right track in the exasperated presence of Erik Hellman’s Alceste, whose very first appearance is a tirade on hypocrisy on the part of those reprehensible poseurs from whom he has just fled in the next room. Hellman also sets the bar for mastery of the rhymed language: never sing-song but rather inflected by the natural emphasis of expression. Thus the very occurrence of rhyme – the choice of rhyming words, and with them sudden turns of thought – can be hysterically funny. It is very much Molière-Wilbur, the impetus from the former, the dazzling modern aptness courtesy of the latter. Opposite Hellman’s sardonic Alceste, in every way, is Grace Gealey’s seductive, self-absorbed, utterly hedonistic Célimène. She’s a born charmer, and at age 20 – as she merrily points out – she’s merely enjoying the perks that come with being young, beautiful and wealthy. To be sure, Célimène spreads her charms around, and she has quite a mix of admirers on the string. One is Oronte, a middle-aged aristocrat accustomed to getting what he wants and prepared to challenge Alceste for the hand of Célimène. A. C. Smith’s pompous Oronte reveals the subsurface vulnerability – the essential humanity – that is the kinder part of Molière’s acerbic portraiture. Knowing that Alceste can be counted on for his candor, Oronte approaches him for a judgment about a poem he has written. Smith’s inflated delivery of this lame lyric, and Hellman’s agonizing efforts to avoid offending the author, and yet not lie about his true opinion, provides one of the show’s funniest episodes. But it is matched later when another, much less obvious devotée of Célimène emerges in the virtuous person of Arsinoé, a grande dame notorious for her puritanical views. Played in wondrous drag by Allen Gilmore, icy Arsinoé cuts a wide and remarkable swath as she migrates from offering comfort to the bereft Alceste one moment, and to Célimène the next. Thus “The Misanthrope” – and this carefully poised account — revels in that gray zone between comedy of manners and farce. 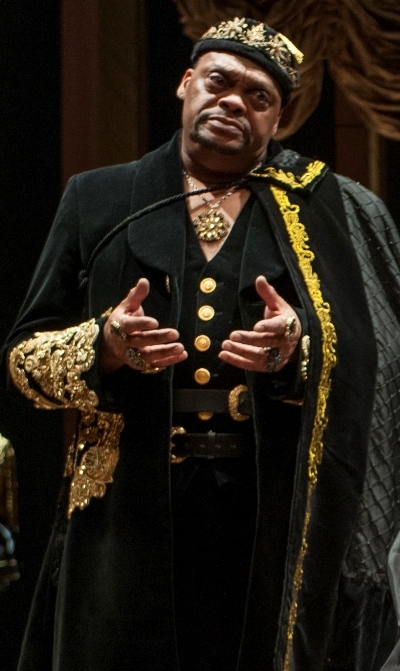 In a key performance, as Alceste’s young, still-optimistic friend Philinte, Kamal Angelo Bolden provides an injection of unspoiled youthful appeal; he also does articulate service as interlocutor to the ranting cynic. Philinte’s prodding exchanges with Alceste edge into serious social criticism, if only to come comically unstitched, and Bolden brings resonant conviction to the younger man’s perspective. I’m sure there’s meaning in the pervasive gold-and-black color scheme that extends from sets to costumes, devised respectively by John Colbert and Jacqueline Firkins. Perhaps the motif is intended to suggest the isolating effect of wealth; one might also sense a neutralizing, even dehumanizing quality – that these oblivious characters have melded into their wealth, have become their folly. At a certain point, the grace and wit of the performance all but drive the color scheme from consciousness. Then again, perhaps these are the colors of perpetuity, of earth and human frailty, ever thus.